Alejandro Hurtado’s time as Celta Vigo is nearing the end. In our previous post we detailed a three year plan on how we are going to win the Champions League. We will make references to the post throughout this update. If you haven’t read this yet, take a look at the link below. Let’s take a look at how Celta Vigo have progressed in the first year of the three year plan. In our last post we discussed the positions that we would need to improve in order to build our Champions League winning squad. Alejandro Hurtado has searched the market and managed to bring in two great first team players. Michael van de Meiracker is a very well-rounded central midfielder. At 22, he, like most of the squad, will be approaching their peak in three years time. Right-back Pepe Diez comes in as a first team player in a position that was highlighted as a key area to strengthen. He is Spanish too. An impressive 3-1 win at home against the Catalan giants left us confident ahead of the season. However a 6-0 demolition by Barcelona brought us back down to earth. Like last year, Celta Vigo have flown out of the blocks in league football, losing just three games out of 17 as they enter the winter break in 4th. A potentially difficult Champions League group was successfully negotiated by Hurtado and his men, albeit progressing in second place. 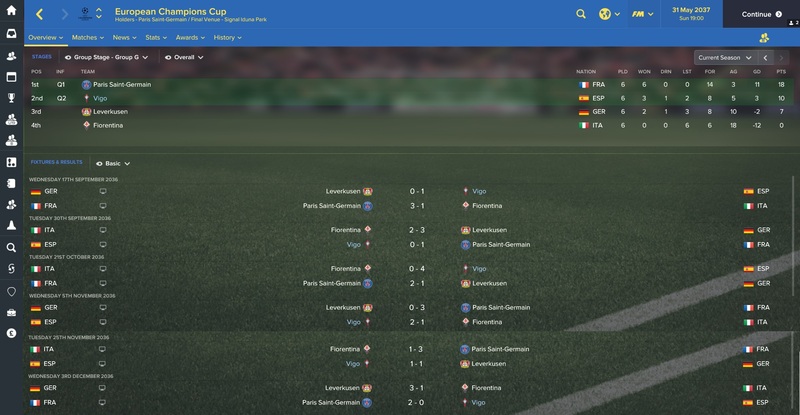 Two impressive away wins in Germany and France helped us secure our place in the knockout rounds. 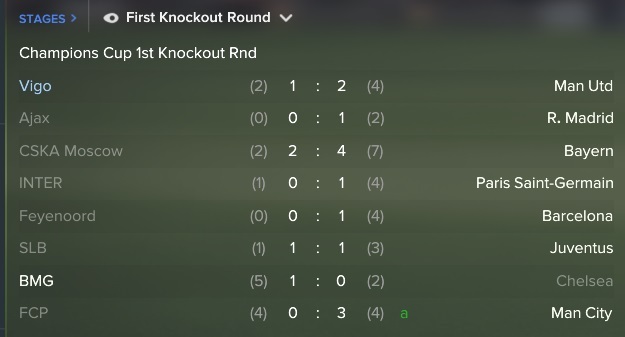 A tough run of games? In the league we have dropped to 6th place after a difficult run of games. However, as a team with lofty ambitions we need to eradicate our inconsistency over the next two seasons if we really want to fight for European silverware. Former player Henrique Canha (who interestingly has not been a huge success at Atletico Madrid despite his £95M move) helped his new employers to a 7-6 aggregate win against Vigo in the Copa del Rey. A tough draw against Manchester United led to our exit. Two 2-1 losses meant that we were knocked out of Europe’s top competition at an earlier stage than last season. Having looked at the teams to progress, we were always going to struggle had we beaten United. Good enough for 4th place? A win against bottom-place Granada in the final game of the season would see us gain the final Champions League spot. Anything other than a win would see us rely on Sevilla to lose for us to retain 4th. A 2-2 draw meant that Sevilla would have to draw or lose. Did they help us out? Europa League football it is. We will have just the one chance of winning the Champions League as we drop out of the CL for next year. Vigo will need a big year next season to set themselves up for one final push in Alejandro Hurtado’s career in Spain. But should we not qualify for the CL next season Hurtado will resign from his role and our series will end on year prematurely. It is safe to say that there is one massive summer ahead of us. Federico Hurtado has begun his managerial career with an outstanding season with Vigo B. Tipped for relegation at the beginning of the year, Hurtado has defied critics and lead his side to 1st place in the league. Since Alejandro Hurtado joined Vigo, the second side of the Galician club have enjoyed a prominent rise in Spanish football. Federico Hurtado will be hoping to follow his success with another good season before he looks to move back to England and begin his solo career without his father’s help. Thanks for reading Part 48 of VivaGlobetrotting. Just two more posts in the series! I hope you have enjoyed following the journey even half as much as I have enjoyed playing it. If you have liked following along, be sure to follow the blog and check out our social networks as linked above. 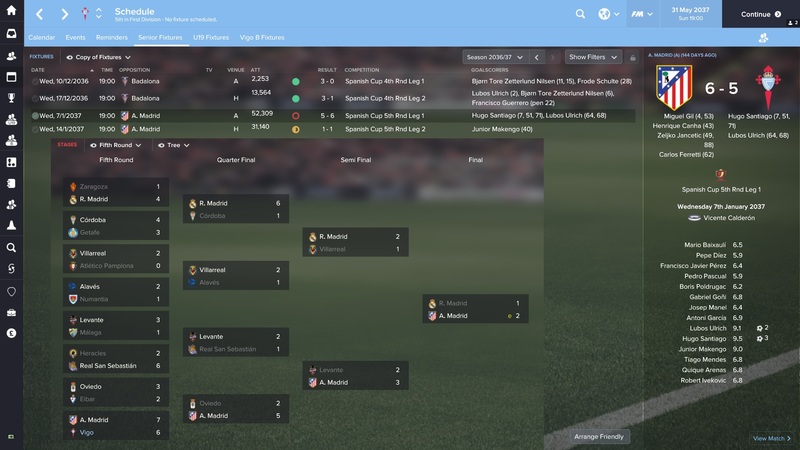 This entry was posted in FM17 Stories, Football Manager 2017, VivaG Spain, VivaGlobetrotting and tagged alejandro hurtado, celta vigo, champions league, copa del rey, europe, federico hurtado, fm stories, fm17, football manager, la liga, VivaG Spain. Bookmark the permalink.